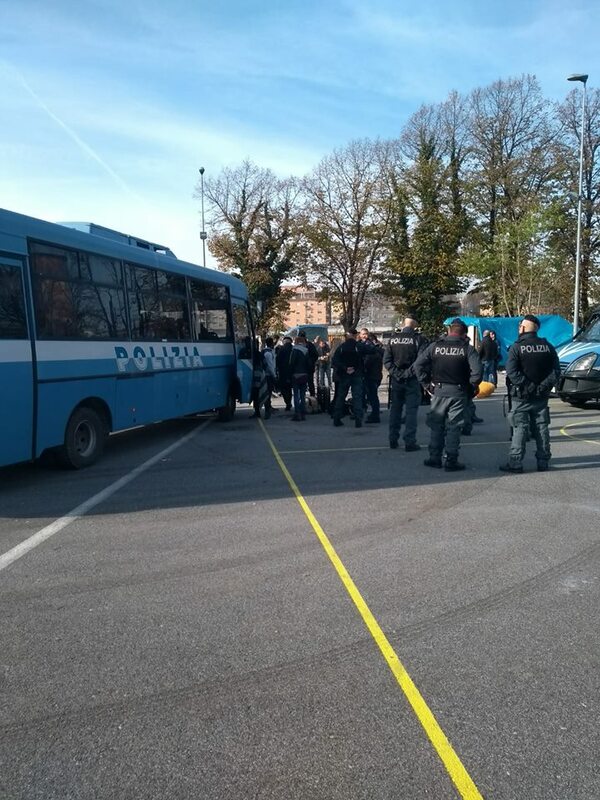 Rome, Italian territory: On Tuesday police evicted the Baobab refugee camp for the 22nd time. Published by Enough is Enough. Written by Riot Turtle. Images by No Name Kitchen Facebook page. Screenshot Salvini tweet by Enough is Enough. Baobab is one of many informal settlements in Rome and provided basic shelter to people who were forced out the system. Baobab was setup for the first time in 2015. Most people stayed only for a few days in the camp before they continued their journey, but others stayed for months. In the days before the eviction about 300 people were staying in Baobab. According to local authorities in Rome 75 people were assigned alternative accommodation this past week, which means that yesterdays 22nd eviction sended dozens of vulnerable people onto the streets as winter sets in. No Name Kitchen works in the Baobab camp and wrote of their Facebook page: “Our worst predictions have been confirmed. Today, Tuesday 13th of November, the Italian police have started to clear the Baobab camp, where the No Name Kitchen has been involved in providing support over the last months. The fascist Interior Minister, Matteo Salvini, has boasted about this measure in a message saying that ‘free zones, without state and legality, will no longer be tolerated’. Nothing could be further from the truth. TOLERANCE will eventually beat racism and we will keep working to achieve it! Still, from the Baobab camp, we send out a big hug to those who, once again, find themselves without the safety of a place to stay. The informal settlements in Rome host 3,500 of at least 10,000 people living mostly in abandoned buildings without basic infrastructure, according to an MSF report (You can read the report here – PDF file) published earlier this year. “Enclaves, where the state and legality are absent, are no longer tolerated. We promised it, we are doing it. And it’s just the beginning,” said Salvini in a tweet, as bulldozers razed the tents activists and migrants had just rebuilt after bad weather destroyed the camp last week. Its not suprising that attacks and repression against refugees are increasing with an Italian coalition goverment of the fascist Lega party and the xenophob 5 star movement. However it should be clear that previous goverments on the Italian territory paved the way for the current far right government. Most of the 22 evictions of the Baobab camp happened before Salvini and his fascist friends came to power. Previous post: #Indonesia: Call for international solidarity to the radical feminist Anindya Joediono!